Kristen’s law career has been exclusively devoted to helping clients with estate planning and elder law issues. She works closely with individuals and their families on all aspects of estate planning and administration, including implementing necessary legal documents, such as a Will, Living Will, and Powers of Attorney. Kristen counsels families through the difficult and confusing process of qualifying for government benefits such as Medicaid, Veterans Benefits, and Social Security. Through strategic planning, Kristen helps individuals to preserve their life savings when facing the high costs of long-term care. Kristen also assists families with establishing special needs trusts for family members with qualifying special needs and with obtaining permission from the Court to serve as guardian for their incapacitated loved ones. Kristen is accredited by the Department of Veterans Affairs to assist veterans with qualifying for the Aid & Attendance Pension, which is a monthly cash payment to wartime veterans and their spouses that can be used to offset today’s high-cost medical expenses. Kristen has achieved the designation of Certified Elder Law Attorney (CELA) from the National Elder Law Foundation. The CELA designation is recognized and authorized by the Pennsylvania Supreme Court and is only awarded to attorneys who have demonstrated extensive experience in practicing in the areas of estate planning and elder law, passed a day-long exam, and received recommendations from other attorneys who specialize in the field. Since 2015, Kristen has been recognized as a “Top Lawyer” in Elder Law by Main Line Today magazine. 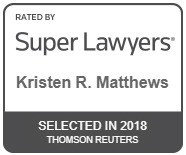 In 2016, Main Line Today named Kristen #1 Top Lawyer in the Elder Law category. Advised executor in probate and administration of mother’s Will. Assisted husband in efficiently obtaining Medicaid benefits for his wife, preserving family assets above the statutory maximum. Planned and implemented a strategy to assist a surviving spouse of a veteran in obtaining Veterans Pension benefits to cover the cost of her medical care. Counseled parents of a special needs child in establishing a Supplemental Needs Trust for their child’s benefit, preserving eligibility for government needs-based entitlement programs. Established trusts for international clients to ease administration of their estates. Prepared Powers of Attorney for elderly parents, allowing children to assist them with medical and financial decisions. Assisted young couple in drafting their wills and setting up a trust and guardians for their minor children. What Do You Do as an Elder Law Attorney? Why Did You Become an Elder Law Attorney? When Should Clients Contact You? We had a fantastic experience working with Kristen in developing an estate plan for our family. We found Kristen to be extremely knowledgeable. She had an excellent way of making complex legal concepts easy for us to understand. Kristen was always quick to respond to our question and answered them in a friendly, clear, and concise manner. She was professional and personable – we felt at home dealing with her. Kristen is very knowledgeable about estate planning and it was a pleasure to work with her. She is most responsive to answering all questions and making sure that all parties involved fully understand the importance of the legal documents that are signed. She has provided estate planning to three generations in our family. We found her fees to be very reasonable, especially when compared to the large Philadelphia firms who do not provide the same personalized services that Kristen provides to her clients. I would highly recommend Kristen for estate planning.